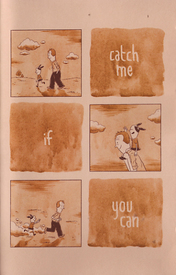 Catch Me If You Can Let's keep going in the small press and self-publishing vein. It seems like we're on a roll here. Here we have three all-new minis, all produced, published, packed and shipped by that Angeleno mini-master, Martin Cendreda! The art and production here is top rate and very reasonable priced considering the effort and low print runs. By turns whimsical, satirical and insightful, these are musts for any and all adherents of the mini-comic form. Recommended!